Love the pic on your instagram of your dog licking your face! It's their grace, I think, that makes cats so appealing. They look like they're drunk. 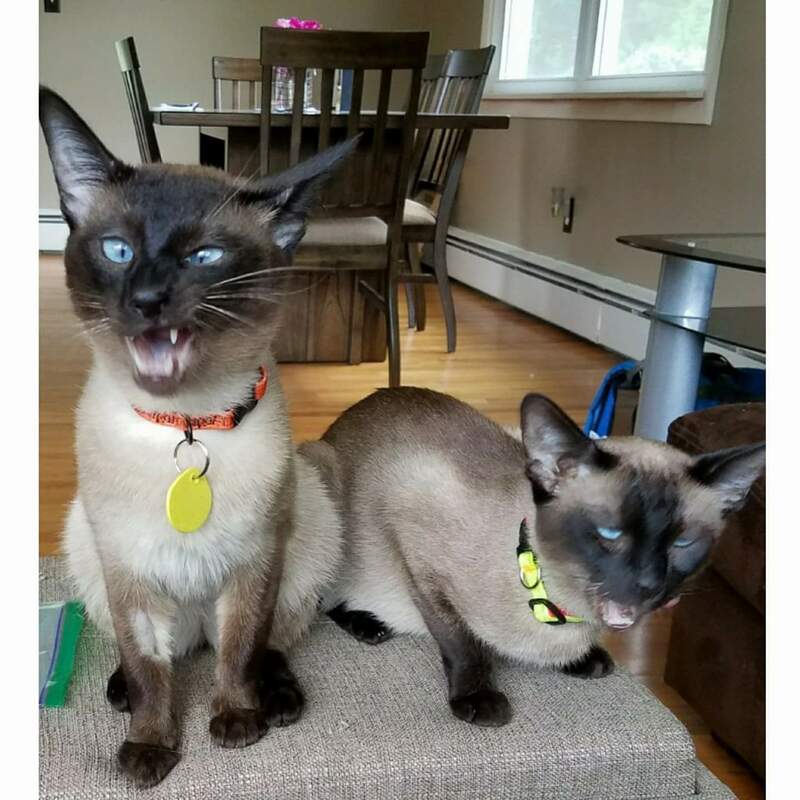 The description said they were trying a new treat. Yeah, they have that "I just ate something tasty" look. That whoever took the picture captured both of them making that face at the same time is great. This old lady is 19⅓ and has now outlived a terminal cancer diagnosis by 3 whole months with nary a blip nor diminished attitude. Her vet said yesterday that it is literally unprecedented in their practice's 3-decade history to have a cat tolerate a diagnosis like this for so long without any effect on quality of life. And I can't have asked for a better gift than soaking up these last 3 months of unexpected bonus time. Unfortunately all good things must come to an end, as she's sitting at zero protection from sudden catastrophic infection due to the gaping hole in her side from a very advanced mammary tumor. This despite the vet saying that if behavior and appetite were the only indications she could possibly keep on going like this indefinitely. I had the option to end it yesterday, but we worked out...what I think...is a fair compromise: give her a victory lap this whole week to eat, drink, and be merry...then reserve the final appointment for this coming Saturday. At the absolute most it would only be deferred for 1 extra week after assessing where we are by phone with vet mid-week...but chances are slim. So this week's agenda is seconds on every meal, 18 hours of napping per day, waking me up at 4:30 in the damn morning, and all the quality time she wants. That's really rough, Rats. Best wishes/good luck to you and the tough old girl. Sorry to hear the time is drawing to a close, Rattie. But it sounds like you've found the right path for you and her. And obviously she's been a great companion over many, many years. Sorry to hear about kitty. This mentally ill boy sends his love. Heartbreaking, RP, and numbingly familiar. Our boy Dickens survived a cancerous tumour, diabetes, innumerable urinary infections and bowel troubles, but finally age and resistance to antibiotics grew too much and we had to let him go. It was a choice made out of our deep love for him, but no less wrenching. Her nineteen-and-a-half years have been a perfect shared gift and giving her this last week of full indulgence is a wonderful expression of affection. I'm so sorry, Ratty. She lived a good long life, but as Doc knows (and I say to everyone), no matter how long our pets live, they never live long enough. She's adorable. And she is obviously very loved. Well, she's not gone yet so it ain't a pity party. It's kitty business as usual this week, and she's still being contrarian and behaving like she's bulletproof. So I'm just going to roll with it. Worrying about next weekend is just a distraction here on a Monday. As JB says mate you've given her a good life and she has been well loved you can't do more than that. Let's hope her remaining time is easy on her.